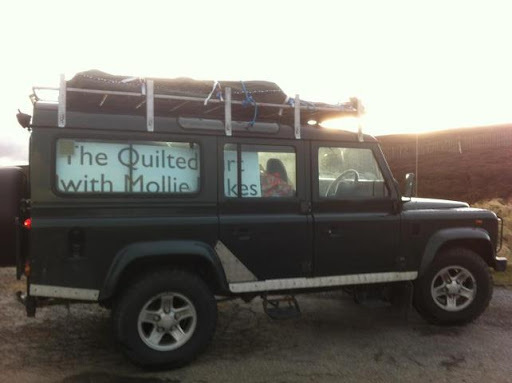 I decided to leave the Yurt rafters and doors strapped onto the Landrover roofrack and Freya accused me of driving around like a hippie loaded up with camping gear. Living up to this reputation, I decided to make the most of the glorious spring weather and cooked sausages over a wood fire while the children strummed their old guitar. It felt like a very short week – after unloading the Landy from the London trip I had to make sure that I had prepared plenty of kits for the forthcoming Yurt outing and workshops in Newcastle. I also did two days of supply teaching and took Freya shopping to make up for the fact that I will be away for her birthday. She took some time to find the right pair of jeans and she was horrified at how her spending money was soon spent. She was disappointed not to find exactly what she had in mind so perhaps it is time to start encouraging some easy attempts at basic dress-making. I think that some hippie style smocks in a Liberty print would look cool but I am sure she would not agree with my idea of fashion. We went for lunch in a sushi bar and had fun picking dishes off the conveyor belt – octopus balls and hairy shrimps were simply scrumptious! I outlined Norse Metallurgy #5 on dark grey satin but I felt that some of my lines were a little wobbly. Hopefully I will be able to disguise that when I add the background fill. 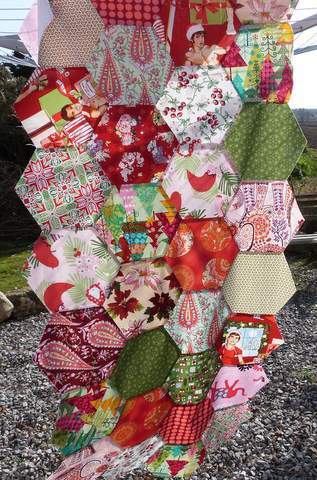 Just for “fun” I joined some of the giant hexagons together by machine. Despite marking the quarter inch stopping points very carefully and using a lot of steam when pressing, there are some joins that are not too neat. I could resort to some remedial decorative embroidery after the quilting is complete if necessary. I drove from Aberdeenshire to North London in 11 ½ hours, listening to BBC Radio 4 and eating rather a lot of sweets. A long journey like that is actually easier done solo as there is no-one else to consider when making stops and there are no bored passengers. I was relieved that the free sat-nav app on my phone told me exactly where to go once I reached the capital. I would never have managed with an atlas and some sticky notes. I was very fortunate to be able to stay with Tania’s step-mother, Maggie, since it meant that I could park the Landy safely and travel into the show by Tube once everything was set up. Predictably, there was not a welcome party awaiting me at Olympia but I managed to hijack a large trolley and a steward who bravely assisted with the job of setting up the frame. The Yurt can be quick and easy to assemble if there are a handful of helpers; it takes a bit longer to get sorted if there is only one or two, particularly if they have seen a yurt before… Everything eventually got tweaked into place, the doors even got touched up with a little paint where they had been scratched in transit and the new pompom trim was pinned into place. There were even electric spotlights inside that replaced my fairy lights and slideshow. 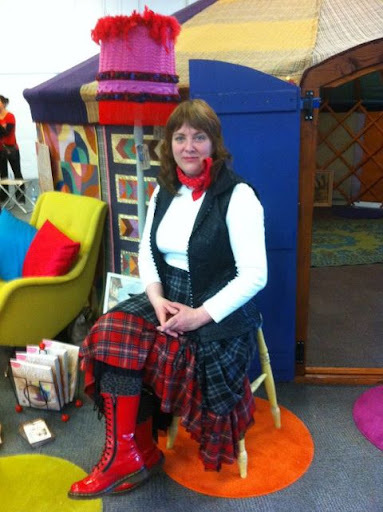 Mollie Makes Magazine was using the Yurt as a “meet and greet” venue for their author book signings so they had brought along some vintage furnishings from a shop in Bath. One of their team explained that in their part of the world an expression of delight is Gurt Lush so my exhibition should be called “Yurt Lush”! It would have been great if we could have acquired a couple of large sofas to create a chill-out area inside. I think I will take along 6 folding chairs with cushions to the next exhibition – there is a limit to how much gear I can fit into the Landy after all! I enjoyed finding out about how a craft magazine is put together by a small editorial team and I also had the opportunity to talk to a few authors and their publishers. It has given me a new impetus to take the long overdue Yurt book forward. The Stitch and Craft Show at Olympia, Kensington was an interesting mixture of cross-stitch, crochet, knitting, felting and paper-crafts on three floors. There was a special exhibit by Quilts 4 London of a selection of the quilts and pennants made to present to Olympic athletes at London 2012. Many of these had been created by groups and represented themes from their local area and several were patriotically red, white and blue. 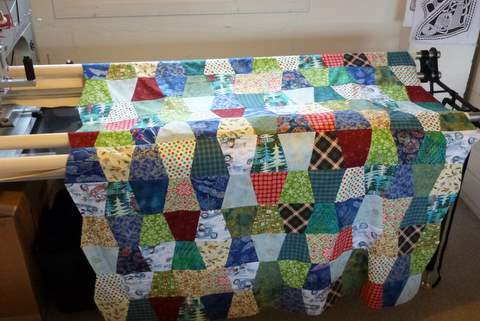 There was a Quilting Live area where visitors were helped to make simple signature blocks using Liberty of London fabrics to make a diamond jubilee celebratory quilt for The Queen. 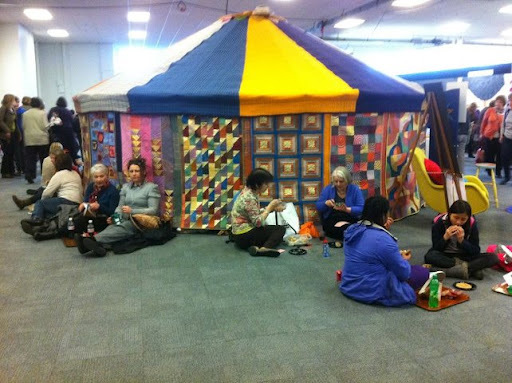 It is always wonderful to see the reaction of visitors to the Quilted Yurt at a show as I have to admit that it really is rather impressive in real life. I tend to forget about it while it is all packed up in my workshop but it is exciting when so many people stop and simply say, “Wow! !” They wanted to know how long it all took, could they buy a book, did I make them to order, what was the amazing gold fabric, and was it waterproof?? I caught up with a few online friends in person, Judi from P&Q Magazine gave me a commission and my Mother came down to see me on a bus trip from Norfolk. I met up with an old school friend in Crouch End whom I had not seen for 7 years and we simply carried on from where we had last left off over a couple of gins followed by a very nice Thai curry. I enjoyed meeting all sorts of people with many different interests. There was an inspiring group of women who had arrived in the UK as refugees who were involved in craft co-operatives in Spitalfields. They loved the welcoming roundness of the Yurt and wondered if they could recreate something similar to use for story-telling and music activities. I hope to hear how members of the Tuwngani Project or Songolo Feet take their ideas further. Lots of people wondered where else the Yurt may appear in the future. The stumbling block seems to be that it takes up quite a lot of expensive floor space but I am more than happy for it to be used as a venue or to contain another exhibition inside. It was amusing that people sat around the Yurt and leaned up against its walls to have their picnic lunches. 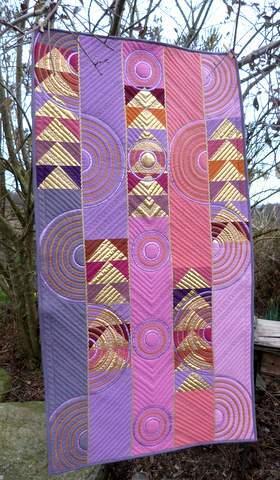 It is such an invitingly tactile quilted project that I wouldn’t dream of telling people not to touch it. They seem to enjoy pointing out all of the patterns and details to each other, wondering how the painted circles are made. Once the show was underway I rather enjoyed myself in London. There is always a sense of adventure when travelling by Tube. There are crowds of people, lots of interesting conversations to eavesdrop, huge escalators; will the doors shut on a packed train? and regular announcements, of “Mind the Gap!” I found it fascinating that a girl was applying her makeup and that two members of the chorus line in “Chicago” were discussing who had got parts on Broadway. 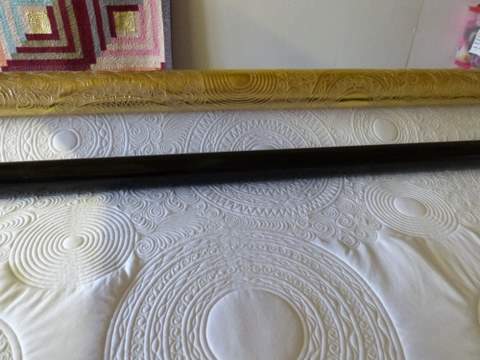 I would love to buy some moquette fabric to make some bags or cushions – I could buy something basic and ready made in the London Underground Museum Shop but I feel that the addition of a few pompoms would make the project even more special. My tube station was closed without warning one day so I had to make part of the journey on the top deck of a red London double decker bus. The last day of the show was a little slower and most exhibitors were rather weary. At 5 o’clock I packed away all of the panels, roof and accessories in less than 20 minutes but there was no sign of anyone to help dismantle the frame. I admit that I began to seethe with frustration as I asked several times for a man with a trolley to assist. Eventually I was assigned two helpful guys and the frame came down in about 5 minutes. They helped me to get the roof spars and doors lashed onto the Landy roof-rack and I battled my way through heavy Sunday night traffic in the dark. I resent the time that is wasted by being ill! At the start of the week I had a couple of days feeling under the weather and all of the good intentions on my Must Do List got scrapped. I wound myself back up to speed by winging it in almost every class in a school on a supply teaching day from story time with P1 to French conversation with P7. I was incensed by this week’s caption on the front cover on the Times Educational Supplement for Scotland suggesting that “undesirable” teachers from England might cross the border and take up teaching posts. I wondered whether I might have missed the Referendum on Independence while I was ill! Of course, there was an explanatory article inside the magazine but as someone who gained a perfectly respectable B.Ed Hons. degree in England, I am still drafting my objection to such an inflammatory headline.